Many people have independely discovered a new design pattern, the “Multiton”, which, like the “Singleton” is an initialization pattern in the style of the Design Patterns book. Like the Singleton, the Multiton provides a method that controls the construction of a class: instead of maintaining a single copy of an object in an address space, the Multiton maintains a Dictionary that maps keys to unique objects. The Multiton pattern can be used in systems that store persistent data in a back-end store, such as a relational databases. The Multiton pattern can be used to maintain a set of objects are mapped to objects (rows) in a persistent store: it applies obviously to object-relational mapping systems, and is also useful in asynchronous RIA’s, which need to keep track of user interface elements that are interested in information from the server. An alternate use case of Mulitons, seen in the “Multicore” version of the PureMVC framework, is the extension of the Singleton pattern to support multiple instances of a system in a single address space. As useful as the Multiton pattern is, this article explains how Multitons use references in a way that doesn’t work well with conventional garbage collection. Multitons are a great choice when the number of Multitons is small, but they may leak memory unacceptablely when more than a few thousand are created. Future posts will describe patterns, such as the Captive Multiton, that provide the same capabilities with more scalable memory management — subscribe to our RSS feed to keep informed. Several problems almost invariably occur as applications become more complex that force the development of an architecture that decouples communication event handlers from the user interface: a straightforward solution is to create a model layer that’s responsible for notifying interested user interface components about data updates. 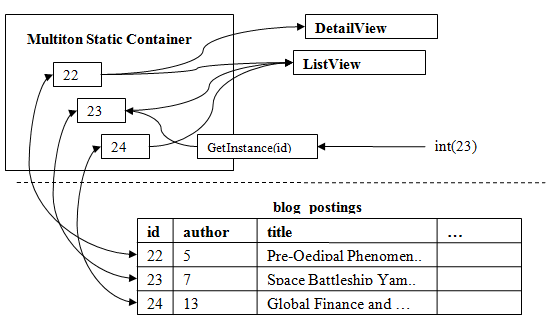 This article uses a simple example application to show how a first-generation approach to data updates breaks down and how introducing a model-view split makes for a reliable and maintainable application. Perl called a dictionary a ‘hash’, a reference to the way Perl implemented dictionaries. (Dictionaries are commonly implemented with hashtables and b-trees, but can also be implemented with linked-list and other structures.) The syntax of Perl is a bit odd, as you’d need to use $, # or % to reference scalar, array or hash variables in different contexts, but dictionaries with similar semantics became widespread in dynamic languages of that and succeeding generations, such as Python, PHP and Ruby. ‘Map’ container classes were introduced in Java about a decade ago, and programmers are using dictionaries increasingly in static languages such as Java and C#. Dictionaries are a convenient and efficient data structure, but there’s are areas in which different mplementations behave differently: for instance, in what happens if you try to access an undefined key. I think that cross-training is good for developers, so this article compares this aspect of the semantics of dictionaries in four popular languages: PHP, Python, Java and C#. The Dictionary count now contains the frequency of items inputList, which could be useful for plotting a histogram. A similar pattern can be used if we wish to make a list of unique items found in inputList. In either case, looking up values that aren’t already in the hash is a fundamental part of the algorithm. This depends, quite precisely, on two bits of sloppiness in PHP and Perl: (a) Dereferencing an undefined key on a hash returns an undefined value, which is something like a null. (b) both languages have a liberal definition of true and false in an if() statement. As a result, the code above is a bit quirky. The if() at line 11 evaluates false if q is undefined, or if q is the empty string. That’s good. However, both the numeric value 0 and the string “0″ also evaluate false. As a result, this code won’t allow a user to search for “0″, and will ignore an (invalid) after_date of 0, rather than entering the block at line , which hopefully would validate the date. The unusual handling of “0″ is the kind of fault that can survive for years in production software: so long as nobody searches for “0″, it’s quite harmless. (See what you get if you search for a negative integer on Google.) The worst threat that this kind of permissive evaluation poses is when it opens the door to a security attack, but we’ve also seen that highly complex logic that strives to be “correct” in every situation can hide vulnerabilities too. This is nice, isn’t it? You can pass any data values you want between Initiator and TheCallback. Sure, the compiler isn’t checking the types of your arguments, but loose coupling is called for in some situations. Unfortunately it’s a little too loose in this case, because we spelled the name of a key incorrectly on line 21. The  operator on a dot-net Dictionary throws a KeyNotFoundException when we try to look up a key that doesn’t exist. I’ve set a global exception handler for my Silverlight application which, in debugging mode, displays the stack trace. The error gets quickly diagnosed and fixed. This operator can be used together with the #2 or #3 operator to safely access a hashtable. Line - illustrates a common usage pattern. One strong advantage of the explicit test is that it’s more clear to developers who spend time working in different language environments — you don’t need to remember or look in the manual to know if the language you’re working in today uses the #2 operator or the #3 operator. Code that depends on the existence test can be more verbose than alternatives, and can be structurally unstable: future edits can accidentally change the error handling properties of the code. In multithreaded environments, there’s a potential risk that an item can be added or removed between the existance check and an access — however, the default collections in most environment are not thread-safe, so you’re likely to have worse problems if a collection is being accessed concurrently. It may be a matter of taste, but I think that’s just awful. The potential of null value exports chaos into the environment: trying to use a null value can cause a NullReferenceException if we don’t explictly handle the null. NullReferenceExceptions don’t bother me if they happen locally to the function that returns them, but they can be a bear to understand when a null gets written into an instance variable that’s accessed much later. Often people don’t care about 1, and the risk of 2 can be handled by specifying a non-null default value. In that case, the script prints “” (treats the undefined variable as an empty string) rather than displaying an error or warning message. PHP will give a warning message if E_STRICT is set, but then it applies the same behavior to hashtables: an error message is printed if you try to dereference a key that doesn’t exist — so PHP doesn’t consistently implement type #3 access. I set a breakpoint on line 53 and found thate the value of outValue was 0, which is the default value of the int type. It seems, therefore, that TryGetValue returns the default value of the type when it fails to find the key. I wouldn’t count on this behavior, as it is undocumented. because the variable value only exists in the block - where it has a defined value. with a default default of false, which is reasonable in PHP. Extension methods are the most controversial feature that Microsoft has introduced in C# 3.0. Introduced to support the LINQ query framework, extension methods make it possible to define new methods for existing classes. Although extension methods can greatly simplify code that uses them, many are concerned that they could transform C# into something that programmers find unrecognizable, or that C#’s namespace mechanisms are inadequate for managing large systems that use extension methods. Adoption of the LINQ framework, however, means that extension methods are here to stay, and that .net programmers need to understand how to use them effectively, and, in particular, how extension methods are different from regular methods. What does this have to do with extension methods? This example does something a bit bold: it attaches an extension method to object, adding an extenson method to every object in the system. This method, object.IsNull() returns true if object is null and false if it isn’t. Some people might see this as a nice example of syntactic sugar, others may see it as reckless. What’s important is that it works: if you run this program from the command line, line  will print ‘true’, while line , which uses an ordinary method, will throw a NullReferenceException. Unfortunately, there are two little problems with that. First, none of us program in a vacuum, so many of us will end up having to maintain or use objects where somebody forgot to include a null check. Secondly, the example between lines  and  isn’t thread safe. It’s possible that a method can be removed from OnLoadData between the time of the null check and the call! and be confident that knowledge about threads and quirks of the type system is embedded in an extension method. in which case you might as well use an ordinary static method on a helper class. What’s wrong with extension methods? I’ve seen two arguments against extension methods: (i) extension methods could make code hard to understand (and hence maintain) and (ii) extension methods are vulnerable to namespace conflicts. I think (i) is a specious argument, but (ii) is serious. and wonder where the heck IsValidEmailAddress() comes from, where it’s documented, and so forth. Practically, Visual Studio understands extension methods well, so a user that clicks on “Go To Definition” is going to get a quick answer. Going further, however, one can imagine that extension methods could transform C# unrecognizably: I think of a friend of mine who, in the 1980′s, liked FORTRAN better than C, and abused preprocessor macros so he could write C code that looked like FORTRAN. This is connected with a fear of lambda expressions, and other features that derive from functional programming. For instance, that beginning programmers just won’t get it. I can make extension methods available by just adding a namespace to my .cs file with a using directive. The compiler scans the namespace for extension methods in static classes, and makes them available. Pretty easy, right? Well, what happens if two extension methods with the same name get declared in two namespaces which get included in the same file? What if we define an extension method on class A, but there’s a conventional method with the same name on class B? What if file One.cs uses namesspace C, and Two.cs uses namespace D, so that ThisExtensionMethod means something different in One.cs and Two.cs? There are real problems in how extension methods interact with namespaces. These problems aren’t as fatal as namespace conflicts were in C (and C++ before namespaces), but they are for real. (i) Instance methods take precedence over extension methods. The definition of an instance method makes extension methods with the same name inaccessable. This happens at the level of methods, not method groups, so two methods with the same name but different signatures can be handled by an extension method and instance method respectively. (ii) Once the compiler tries extension methods, processing works backwards from the closest enclosing namespace declaration outward, trying extension methods defined in using groups. (iii) The compiler throws an error when there are two or more extension methods that are candidates for a spot. Matt Manela demonstrates an interesting example on the MSDN forums. With three examples, he demonstrates that the existence of an instance method (that overrides both extension methods) will suppress the generation of an error message about a conflict between extension methods. This indicates that potentially conflicting extension methods in two namespaces will only cause an error if an attempt is made to use them. The compiler raises an error if there is any ambiguity as to which extension method to apply at a particular invocation — code won’t silently change behavior upon adding a new namespace in a using directive. The compiler does not throw an error if potentially conflicting extension methods are declared in two different namespaces including in distinct using directives if those extension methods are not used — therefore, conflicting extension methods won’t automatically prevent you from using any namespaces you choose. An instance method can silently shadow an extension method. A change in the definition of a method could cause the behavior of a (former) extension method cal to change in a suprising way. On the other hand, this could be a useful behavior if you’d like a subclass to override a behavior defined in an extension method. A common bit of advice that I’ve seen circulating is that extension methods should be defined in separate namespaces, so that it would be possible to include or not include extension methods associated with a namespace to avoid conflicts. I think this is based on superstition, for, as we’ve seen, conflicting extension methods do not preclude the use of two namespaces; this advice is certainly not followed in the System.Linq namespace, which defines a number of valuable extension methods in the System.Linq.Enumerable static class. We’re still learning how to use extension methods effectively. Although extension methods have great promise, they’re difference from ordinary instance methods in a number of ways. Some of these, like the difference in null handling, are minor, and could potentially be put to advantage. Others, such as the interaction with namespaces in large projects, are more challenging. It’s time to start building on our experiences to develop effective patterns for using extension methods. Silverlight 2 Beta 2 has changed the concurrency model for asynchronous communications. In Silverlight 2 Beta 1, asynchronous requests always returned on the UI Thread. This was convenient, since updates to the user interface can only be done via the UI thread. As of Silverlight 2 Beta 2, asynchronous callbacks are fired in worker threads that come from a thread pool: although this potentially allows for better performance via concurrency, it increases the risk for race conditions between callbacks – more importantly, some mechanism is necessary to make code that updates the user interface run in the UI thread. It’s straightforward to execute a function in the UI thread by using the Dispatcher property of any ScriptObject The tricky part is that ScriptObjects are part of the user interface, so you can only access the Dispatcher property from the UI thread. At first this seems like a chicken-and-egg situation: you need a Dispatcher to get to the UI thread, but you need to be in the UI thread to get a Dispatcher. At some point in the future, you can transfer execution to the UIThread by scheduling a function to run in it. If your application is complex, and you have nested asynchronous calls, you’re left with an interesting question: where is the best place to switch execution to the UI thread? You can switch to the UI Thread as soon as you get back from an HttpRequest or a WCF call and you must switch to the UI Thread before you access any methods or properties of the user interface. What’s best? It is simple and safe to switch to the UI Thread immediately after requests return from the server. If you’re consistent in doing this, you’ll never have trouble accessing the UI thread, and you’ll never have trouble with race conditions between returning communication responses. On the other hand, you’ll lose the benefit of processing responses concurrently, which can improve speed and responsiveness on today’s multi-core computers. It’s straightforward to exploit concurrency when a requests can be processed independently. For instance, imagine a VRML viewer written in Silverlight. Displaying a VRML would require the parsing of a file, the construction of the scene graph and the initialization of a 3-d engine, which may require building data structures such as a BSP Tree. Doing all of this work in the UI Thread would make the application lock up while a model is loading — it would be straightforward, instead, to construct all of the data structures required by the 3-d engine, and attach the fully initialized 3-d engine to the user interface as the last step. Since the data structures would be independent of the rest of the application, thread safety and liveness is a nonissue. Matters can get more complicated, however, if the processing of a request requires access to application-wide data; response handlers running in multiple threads will probably corrupt shared data structures unless careful attention is paid to thread safety. One simple approach is to always access shared data from the UI Thread, and to transfer control to the UI Thread with UIThread.Run before accessing shared variables. Silverlight 2 Beta 2 introduces a major change in the concurrency model for asynchronous communication requests. Unlike SL2B1, where asynchronous requests executed on the user interface thread, SL2B2 launches asynchronous callbacks on multiple threads. Although this model offers better performance and responsiveness, it requires Silverlight programmers to explicitly transfer execution to the UI thread before accessing UI objects: most SL2B1 applications will need to be reworked. This article introduces a simple static class, UIThread, which makes it easy to schedule execution in the UI Thread. Most programmers have a habit of using one or the other — this isn’t usually a conscious decision, but more of a function of which form a programmer saw first. I, for instance, programmed in Java before I learned C#, so I was already in the prefix cast habit. People with a Visual Basic background often do the opposite. There are real differences between the two casting operators which can make a difference in the reliability and performance of your application. The major difference between prefix- and as-casting is what happens when the cast fails. Imagine, for instance, that g is really an instance of AnotherSpecificType, which is not a subclass of SpecificType. In this case, the prefix-cast throws an exception at line  — however, the as-cast returns null when the cast fails, letting the execution of the program barrel on. It’s easier to implement correct error handling in programs that use prefix-casting, and programs that use prefix-casting are easier to debug. Prefix-casting causes an exception to be thrown at the moment of the cast, where the problem is obvious. As-casting, on the other hand, can cause an exception to be thrown at the moment where the SpecificType t is referenced. The used of the SpecificType can be far away in the program: it can be in another method, or another class — it could even happen hours after the cast is performed. Be it in development or production, bugs caused by corrupted data structures can be maddeningly difficult to find and correct. The pattern of testing for null after an as-cast has a few problems. (i) It doesn’t distinguish between the case of the original object being null from the case of the original object being the wrong type and (ii) correct error handling often requires more contorted logic than using an exception — and once you added test logic, you’ve lost the speed advantage of as-casting. It’s less convenient, however, when you’re writing a set of migration scripts in SQL to implement changes that you make over the database in time. Specifically, if you create the table twice in two different databases, the hexadecimal string in the name of the key will be different — the ALTER TABLE statement will fail when you try to drop the index later, since the name of the key won’t match. It’s just that simple. Similar stored procedures can be written to convert fields from NOT NULL to NULL and do other operation which required a named constraint. Several things change in this example: (i) the AddToCount function gets broken up into two functions: one that does the work before the GetCount invocation, and one that does the work after GetCount completes. (ii) We can’t return a meaningful value from AddToCountCallback, so it needs to ‘return’ a value via a specified callback function. (iii) Finally, the values of outerCallback and amount aren’t automatically shared between the functions, so we need to make sure that they are carried over somehow. In this case, a context object is passed to the asynchronous function, which passes the context object to the callback. The advantage here is that there aren’t any constraints on how the callback function is implemented, other than by accepting the context object as a callback. In particular, the callback function can be static. A major disadvantage is that the asynchronous function has to support this: it has to accept a state object which it later passes to the callback function. Note that, in this API, the Request object needs to be available in myHttpCallback because myHttpCallbacks get the response by calling the HttpWebResponse.EndGetResponse() method. We could simply pass the Request object in the state parameter, but we’re passing an object we defined, myHttpCallback, because we’d like to carry additional state into myHttpCallback. Note that the corresponding method for doing XMLHttpRequests in GWT, the use of a RequestBuilder object doesn’t allow using method (1) to pass context information — there is no state parameter. in GWT you need to use method (2) or (3) to pass context at the RequestBuilder or GWT RPC level. You’re free, of course, to use method (1) when you’re chaining asynchronous callbacks: however, method (2) is more natural in Java where, instead of a delegate, you need to pass an object reference to designate a callback function. Note that two pieces of context are being passed into the callback function: an HttpWebRequest object named Request (necessary to get the response) and a CallbackFunction<String> delegate named OuterCallback that receives the return value of the asynchronous function. Unlike Method 1, Method 2 makes it possible to keep an unlimited number of context variables that are unique to a particular case in a manner that is both typesafe and oblivious to the function being called — you don’t need to cast an Object to something more specific, and you don’t need to create a new class to hold multiple variables that you’d like to pass into the callback function. Method 2 comes into it’s own when it’s used together with polymorphism, inheritance and initialization patterns such as the factory pattern: if the work done by the requesting and callback methods can be divided into smaller methods, a hierarchy of asynchronous functions or commands can reuse code efficiently. In both C# and Java, it’s possible for a method defined inside a method to have access to variables in the enclosing method. In C# this is a matter of creating an anonymous delegate, while in Java it’s necessary to create an anonymous class. The details are different in C# and Java: anonymous classes in Java can access local, static and instance variables from the enclosing context that are declared final — this makes it impossible for variables to be stomped on while an asynchronous request is in flight. C# closures, on the other hand, can access only local variables: most of the time this prevents asynchronous requests from interfering with one another, unless a single method fires multiple asynchronous requests, in which case counter-intuitive things can happen. In addition to receiving return value(s), callback functions need to know something about the context they run in: to write reliable applications, you need to be conscious of where this information is; better yet, a strategy for where you’re going to put it. Closures, created with anonymous delegates (C#) or classes (Java) produce the shortest code, but not necessarily the clearest. Passing context in an argument to the callback function requires the cooperation of the called function, but it makes few demands on the calling and callback functions: the calling and callback functions can both be static. When a single object contains both calling and callback functions, context can be shared in a straightforward and typesafe manner; and when the calling and callback functions can be broken into smaller functions, opportunities for efficient code reuse abound.